The Urban Arts Partnership, Story Studio is a program run by P.S. 132. The program was established as an innovative arts and English language integration program for upper elementary, middle and high school students. Students with limited English ability are supported in the program as they learn, grow and become more connected to their new environment and communities. 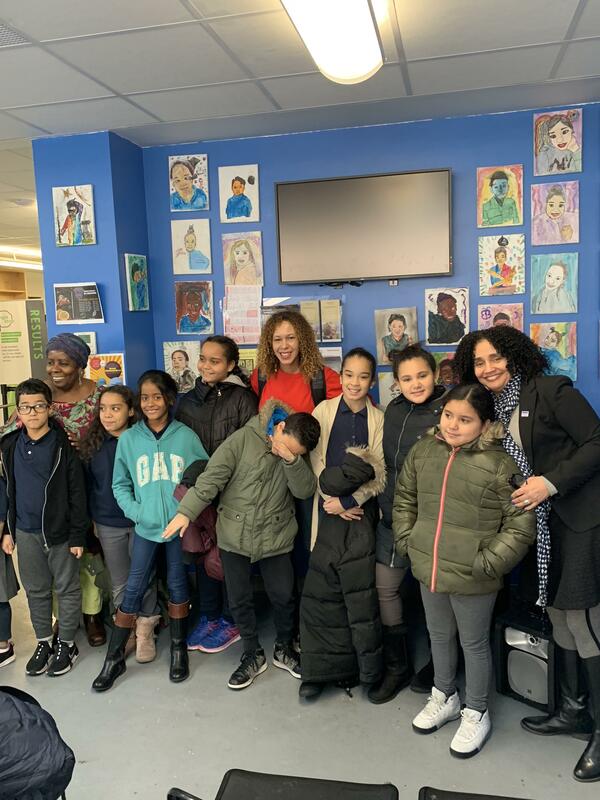 The students of the Urban Arts Partnership program brought their talents to NMIC and created a series of paintings that lined the walls of NMIC’s lobby, creating a colorful, familiar, and warm environment. The student's paintings were all self-portraits titled “I Am” a proclamation of their self-identity and pride, accompanied by self-describing short poems. The students recited the poems in our lobby area as our clients waited to be seen. It was a heartwarming sight and a gentle reminder that immigrant experiences transcend ages. The “I AM” project is the first writing assignment in the Story Studio framework, which enables students to self-reflect and begin to consolidate the expanding and ever-changing facets of their self-identity “Many people don’t realize that immigrants must form a new identity when they leave their home countries. The students I work with are all creating a new identity and it is very challenging for them.” Said Urban Arts Partnership Instructor, Ruthy Valdez. The program allows students to learn and grow with students experiencing the same challenges and supports their growth in ELA, the arts and beyond. If Ruthy could share one thing with the public it would be the importance of giving back to our communities, especially children. And the knowledge she has of the incredible impact including the arts can have in a child's healing, growth, and academic improvement. “The students become more confident, self- assure, and outspoken in all areas of their lives. By participating the students create a life marker where they can remember doing something courageous and amazing.” It is the work we do together as a community that has a lasting impact. Do you want to make an impact? Support our Education & Career Services program. Click here to donate. View Highlights of the Student's Performance.